The Series 7 Agrotron 7250 TTV has closed out a successful 2012 having garnered a string of important awards. Foremost among these were “TRACTOR OF THE YEAR 2013” and “Golden Tractor for Design”, given at the most recent edition of EIMA International, held last November in Bologna. The prestigious international “Tractor of the Year” award is assigned each year by a panel of journalists specialised in the agricultural sector from all the main European countries. This year the editorial staff of more than twenty international publications carefully vetted the features of the best tractors on the market and awarded the DEUTZ-FAHR 7250 TTV Agrotron the title of Tractor of the Year and also voted it the Golden Tractor for the design. Also at the Bologna event, the 7250 won the “Technical Innovation” award for a trailer hitch system developed jointly with TopCon Precision Agriculture. Finally, the 7250 TTV Agrotron ended 2012 by collecting another accolade during December, in the prestigious “Good Design Awards 2012”, one of the “world's most prestigious awards for new product design and graphics”, organised by the Chicago Atheneum, museum of architecture and design, in partnership with the European Centre for Architecture, Art, Design and Urban Studies. The coveted award has been assigned yearly since 1950, when it was founded in Chicago by architects Eero Saarinen, Charles and Ray Eames, and Edgar Kaufmann, Jr. to acknowledge the best consumer products in terms of functionality, aesthetics, innovation and ergonomics. All these important awards recognise the great work undertaken by SAME DEUTZ-FAHR, owner of the DEUTZ-FAHR brand, to establish itself as a top player in its sector. The Series 7 Agrotron 7250 TTV has closed out a successful 2012 having garnered a string of important awards. Foremost among these were “TRACTOR OF THE YEAR 2013” and “Golden Tractor for Design”, given at the most recent edition of EIMA International, held last November in Bologna. The prestigious international “Tractor of the Year” award is assigned each year by a panel of journalists specialised in the agricultural sector from all the main European countries. This year the editorial staff of more than twenty international publications carefully vetted the features of the best tractors on the market and awarded the DEUTZ-FAHR 7250 TTV Agrotron the title of Tractor of the Year and also voted it the Golden Tractor for the design. The new DEUTZ-FAHR Series 7 TTV range is targeted both at contractors and large scale farmers and offers tractors designed to provide reliability, efficiency and productivity. The range comprises three models: the 7210, 7230 and the 7250, the latter rated at a maximum of 263hp. Power is provided by a new six-cylinder DEUTZ TCD 6.1 litres engine which meets the Stage lll B (Tier 4 interim) emissions requirements - exhaust gasses are treated by an SCR catalytic converter. Engine design features include four valves per cylinder, centrally positioned injectors, a turbocharger, an intercooler and a waste gate along with DCR (DEUTZ Common Rail) high pressure fuel injection system operating at 2000 bar. Maximum rated power is delivered at an engine speed of 1900 rpm and the power remains virtually constant between 1600 rpm and 2100 rpm. The Series 7 TTV range is an example of DEUTZ-FAHR’s successful downsizing strategy which uses a high degree of technology in the design and construction of engines to scale down their size and, with it, fuel consumption overall. These engines can also run on biodiesel fuel, either blended with ordinary diesel or 100% pure. The TTV transmission is manufactured by ZF and is a tried and tested system which is universally respected for its design and reliability within the agricultural tractor manufacturing business. It provides a top speed of 60kph and, when travelling at 40kph, allows the engine to run at a fuel saving 1300rpm. Control is via a joystick which provides infinitely variable speed variations from zero through to its top speed. For the pto, the 7210 TTV is equipped with a 540/540E/1000/1000E gearbox with mechanical selection, and the larger two models have 540E/1000/1000E speeds as standard with selection made using an electro-hydraulic clutch which also provides a soft start pick-up. An active wheel slip control operates when the tractor slows down after the accelerator is released. It is a feature which also activates automatic engagement of four wheel drive and differential lock and is designed to increase safety when transporting heavy loads on steep gradients. Braking is catered for by the PowerBrake and there is the electronic parking brake (EPB) which provides ‘smart’ braking in response to the load and data received from the active control of the TTV transmission. In the hydraulic system there is a separate power steering pump and a 44 litre/min pump to power auxiliary circuits. For the main hydraulic system there is a load sensing pump rated at 120 litres/min (165 litres/min can be specified) which feeds four double acting spool valves as standard and up to seven if requested. There is a further option for two spool valves to be fitted at the front of the tractor. All spool valves have timer and flow control functions and their operating levers and ports are colour coded. Maximum lift capacity for the rear linkage is 10,000kg, the control is handled by the tractor’s EHR electronic management system which offers functions which include quick soil engagement, oscillation damping for mounted implements, position selectable transport lock, lift height limiter, rate of drop control and maximum permissible wheel slip setting. Front lift capacity for the optional front linkage is 4500kg. The Series 7 TTV range’s new MaxiVision cab, which will be standard on all continuous Tier 4i tractors over 120hp, has all its key operating elements for engine control, driving, pto-functions and hydraulic control located on the new armrest along with the new joystick control. As standard, the tractor is equipped with the new coloured work display which helps to give a clear indication of the task each function is responsible for. 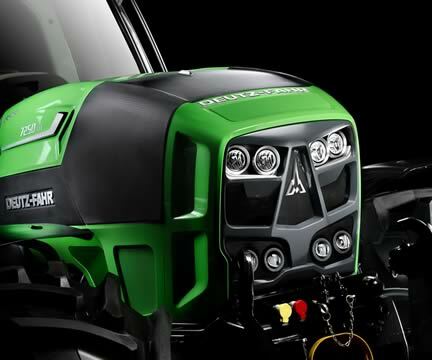 This operating concept was developed by DEUTZ-FAHR working together with farmers, contractors and Giugiaro Design, the latter one of the leading design companies in the automotive business. For the cab itself, extensive use of glass provides good unrestricted views of proceedings and high quality of materials are used throughout the cab – not least in the seating department where the driver and passenger can now enjoy even thicker padding.